I love graffiti artist Shepard Fairey’s work – you know him..remember this piece, you probably saw it around…. He has installed a giant 100 ft mural for the London Olympics in the newly constructed Pleasure Gardens. Check out this behind the scenes of his process. And for more info on the Pleasure Gardens check in here, there a whole ton of fabulous art to be enjoyed there. I so wish I was in London this summer! When we bought the house we were super excited that it came with a pool house – it sounds super duper fancy to say you have a pool house!!! However the reality is that its more like a big old shed with a toilet and a ton of spiders facing a very old and weathered pool. Not really so awesome for guests wanting to come and visit us. Please let me stay here! And that I can decorate it inside like a gorgeous swedish lakeside cabin..
Of course this dream is about a year away from becoming reality but its good to start planning it me thinks. And then yes, you can TOTALLY come and stay! Sharing my Pinterest addiction: who to follow…..
Have you heard of Pinterest? YES I bet you have!!! and I bet you are spending TONS of time on it too. Did you know that it’s now the fastest growing site in the history of the internet EVER? Crazy fact, but I can totally see why as I am 100% addicted! 2. West Elm : another favorite brand who have a great blog too called Front & Main (check it out)..
3. Rue Magazine : gorgeous and stylish ideas and inspiration for every area of your home. 4. Better Home & Gardens : A little more traditional than my usual modern taste but some stuff is gorgeous plus they have excellent cookery to interiors to DIY their stuff is gorgeous and supremely practical! 6. Remodelista is a remodelers source book go-to. I highly recommend their boards for inspiration on all aspects of your home remodel. 5. Emily Henderson : Emily has a great selection of pins from interiors to stylish pieces for the home and personal style as well. 7. The Novogratz : Everybody’s favorite design duo offer great pins on style, design ideas and perfect adornments for kids rooms. 8. Adore Home Magazine : One of my favorite online magazines and actually produced in Australia , they feature beautiful interir ideas all listed by color scheme which is genius for anyone looking to find inspiration in a particular shade. 9. Julia Johnson (the Boo and the Boy) : Julia’s blog is one of my top go to’s for kids room inspirations but her pins also feature plenty of grown up spaces too. 10. Meg Biram of Mimi + Meg : I seriously love EVERYTHING that Meg posts particularly her style. She has my exact taste in well everything. I’d like to think that one day we could be friends! p.s if you are not on Pinterest and would like an invite shoot me a note in the comments and I’ll send you one! Once a year my company heads out to Palm Springs to enjoy a week in the sunshine at the Palm Spring Photo Festival. It’s a great gig to go on as not only do you get to meet world-wide famous photographers and enjoy great artwork but you also get to hang out in one of the coolest homes of architecture ever. Palm Springs flourished in the 1920’s as a Hollywood escape and the architecture infamy began as the multitude of stars commissioned many homes to be built-in the area. The “desert modern” style was born and with it came some of the most innovative buildings we’ve seen to date. I’m by no means an expert in architecture but I know that this town has masses of gorgeous homes and buildings to look at and a unique cultural identity because of the modernism influence. And the Miller house both designed by architect, Richard Neutra. Nowadays Palm Springs is the ultimate desert getaway – with many of the former mid-century motels and buildings being restored to their former glory into hip places to stay and great restaurants. There’s great design all around this city and a great history of Hollywood celebs hanging out here in the desert. Once of my favorite new hotels is the Ace Hotel. Its rooms are equally cool – using a mixture of vintage and modern furniture that fits in perfectly with the Palm Springs style. And then there’s the Movie Colony motel, a seriously cool restored hotel that was originally designed by Albert Frey in 1935. Frey actually studied under Le Corbusier in Paris before moving to the states and the Movie Colony Motel was one of his first projects. Or try the Orbit Inn, which was built-in the classic mid-century modern style. Its furnishings are all refurbished period pieces from the 1950’s and it has stayed true to its original exterior whilst remaining a comfortable place to relax. The Parker is built on luxurious living in the desert – it was kitted out by Jonathan Adler who shopped estate sales for the eclectic decor to recreate the Palm Springs of the 1950’s through the 1970’s. The Parker is the ultimate in pampering – at night soft lambswool rugs are laid out next to your bed!!! and finally check out the wild colors of the Saguaro which was recently refurbished and opened its doors in Feb this year. Its named after the famous cactus of the Sonoran desert ! The pool with all the different colors look amazing here…. Such a great place to visit and relax for a few days – I’m already planning my next mini break to this home of modernism! Coming next is my top tips for vintage shopping in the desert! I have literally become obsessed with interior and home design books during the process of this renovation. I have literally read hundreds! And although I do try to order them in from our local library (which is a great way to check out how useful a book will be for you) I also seem to find myself buying them at a rate of knots….not only do they have tons of inspirational images in but many have great advice in them too about how to achieve that look. So here’s my top ten recommendations of books to help you design your home space. 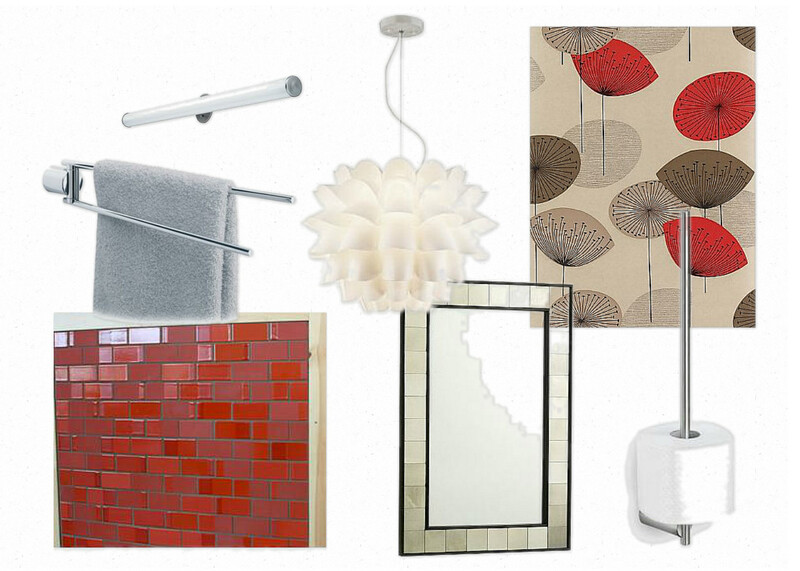 Downtown Chic: Designing your dream home. I have been toying with a door to seal off the formal lounge from the kitchen/family room and we thought about doing someting in the vein of this sliding barn door. Its a really functional but stunning way to create some privacy and seal off some of the family noise from the front of the house. 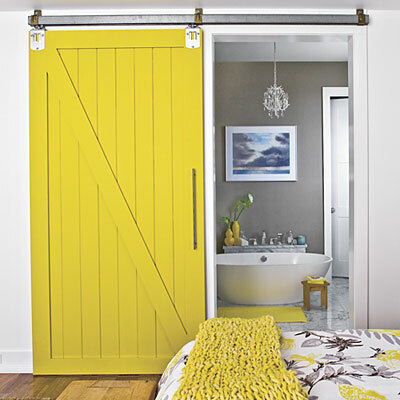 Sliding barn door from Southern Living. 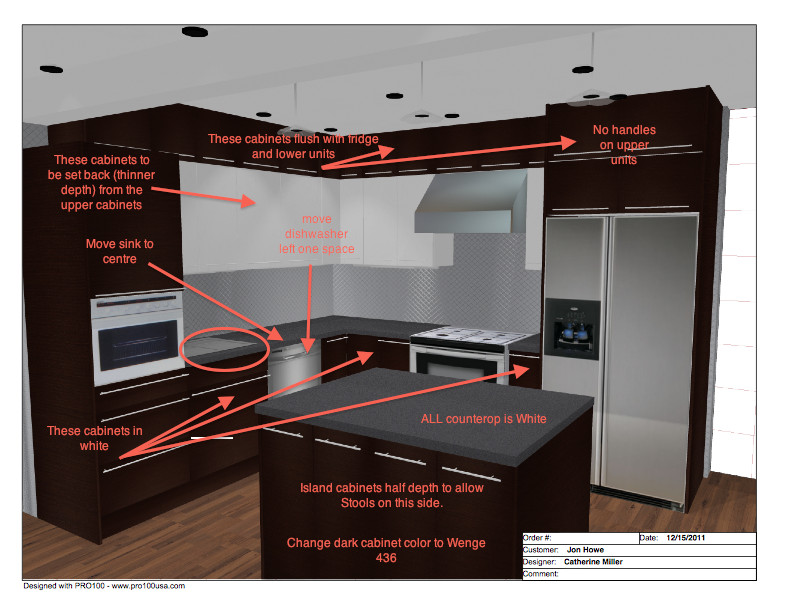 A while ago, in fact maybe 6 months or so ago I posted that we started talking to Kitchen-zilla about a design for a kitchen. As things got a little hairy over the summer (i.e. a new baby and no roof!!) we forgot all about our kitchen design in favor of focusing on the things that needed to get done that week! Now that we are prepping to build out the extension we need to get back on the kitchen trail so that we can establish the zones of the extension properly. Jon happened to be in Denver on business which is where kitchen-zilla are based and so he popped into the showroom. We have been using this kitchen design that we found on Houzz as our ideal design and wanted to see if kitchen-zilla could get close to it. Kitchen – modern – kitchen –. I love the off-set cabinets (which add tons of storage) and the contrast between light and dark. Also the white countertops and backsplash lift the whole design and keep it very clean-looking. Our kitchen wont be quite as big so we need to be very tight on where everything should go and make the most of the space we do have. Here’s what they came back with and some of my feedback on it! I’m excited to see their take on my feedback and what they come back with next as it feels as tho we are getting close to a final design. Ice Cube studied Architectural drafting? Now I never knew that. Love that he’s celebrating the design style of Eames. The boy’s got good taste. The powder room downstairs is done, build wise. As in everything is in its place (taps, sink, loo etc) and its working just fine but, well it just doesn’t look very pretty. Its very white and plain and functional. And so I want to really glam it out but Jon isn’t keen on that idea. So we have compromised and came up with this vision instead , a Mad Men inspired 1950’s retro powder room with modern finishes. The tiles are a bit of a bold choice for us and were what drove the entire look and feel of this room but I think it will be awesome once its done and very unexpected. Well it better be as we already bought the tiles so are kind of committed now- gulp! I love having fresh flowers in the house, they brighten up any corner of a room and make me smile, however, with my crazy busy lifestyle I don’t have the time to shop for them very often, lord knows I don’t get them on a regular basis from my husband and when I do have them in the house they always seem to quickly die on me! So I’ve been considering getting some silk flowers to have in the house as permanent arrangements to add some color and life (pardon the pun!) into our rooms. I’ve been pretty impressed with the quality of some of the arrangements I’ve found, they are very realistic and are in my fave bright colors and blooms! Check these arrangements and sellers out for some fake flower style……. Autumn Orange Peony Silk Flowers by HeatherMBC on Etsy. Beautiful Peony Sweet Pea Silk Flower Arrangement by farmerjulie. Moss Ball Centerpiece by farmerjulie on Etsy.